The board game traces its humble beginnings in 1860 through the brilliance of Milton Bradley, an American Lithographer and an innovator of board games in the United States. When he first introduced the game, it was called “The Checkered Game of Life”. Basically, it revolves around a person’s journey through life – attending college, choosing a career, marrying, having children, until retirement. It can be played by 2 to 6 persons; the goal is to retire with the most money. The game is played on a board with illustrations of a track, a spinning wheel with the numbers 1 through 10. Players each use a peg to represent their characters in the game. There are also houses, cars, buildings, and mountains to use to make the game more interactive. Play money and a bank tray are also included in the package to serve as the keeper of all assets. Remarkably, it sold around 45,000 copies on its first year of production – marking the beginning of a worldwide phenomenal board game that will entertain millions of people for generations and continues to do so. An updated version came out in 1960, on the 100th Anniversary since it was launched into the market. This one has a modified checkerboard for the main board, and the name of the game was changed to “The Game of Life”. Many changes have also been made – the cars were modernized, monetary values increased, insurance and stocks were added to the assets, and “Lucky Day” spaces were added as bonus. At the beginning of every game, each player starts with $ 10,000; then on the first turn, they decide whether to start a career or go to college. As the game progresses, the players may get married, have children, buy a house, a car, and invest in stocks or gamble. The average play time of the game varies; with the end goal of everyone reaching retirement – whoever retires with the most money and assets is declared the winner. If you’ve already read reviews or blogs about this product, you may have noticed that one of the prominent observations was that the game was more of a game of chance than strategy. Well, that was the original concept of the game anyway. As a matter of fact, with the game being very easy to play, it greatly outweighs its shortcoming. The Game of Life: Extreme Reality – this is one of the most spontaneous versions of the board game; you get to add your own story to the game. You can live in a castle, in a space station, or even a shoe house! The Game of Life: Rock Star – this was launched in 2009 where players get to be their own rock star selves. Starting at a garage band, Recruiting Band Members, Touring on Buses, and Performing on Concert Venues are what this game is about. The Game of Life: Star Wars (Jedi’s Path) – this version appeals to a large audience especially the countless fans of the well-known series. This version is now considered rare and a collector’s item if owned as it has not been manufactured a long time. The Game of Life: Indiana Jones – introduced in 2008 in support of the release of the latest installment of the movie franchise – The Kingdom of the Crystal Skull. 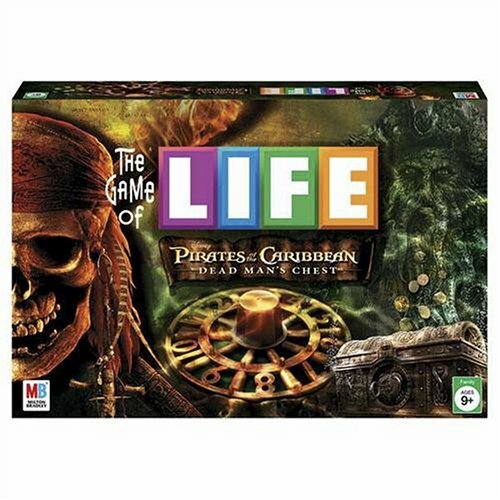 The Game of Life: Pirates of The Caribbean (Disney Theme Park Edition) – this was launched in 2004 for Disney, being a product of the movie’s fame. The game involves going through a pirate’s life. This version is only sold at Disneyland Resorts. Movie editions were later published in 2006 (Dead Man’s Chest) and 2007 (At World’s End) and were made available for the local public on most toy stores and bookstores. The Game of Life: Spongebob Squarepants – this was published in 2004; and targets youngsters. Players move around the hit TV series’ plot setting, Bikini Bottom; and instead of children, pets are acquired through the game. In conclusion, it is evident that the game has greatly contributed to the establishment of the board game industry both in the U.S.A. and internationally. It has captured the attention of many mainly because it is an embodiment of what an ideal life is. Plus, parents not only get to teach their children to participate in family quality time; they are also given the opportunity to show their children how to get through life in a methodical manner. Check out this cool Game of Life, Pirates of Caribbean – Dead Man Chest Edition Board Game.